In the early 1980s, a group of angry farmers grabbed their rifles and shotguns, donned ski masks and posed for the press. The picture, taken in the haymow of an old barn near Owen Sound, was front-page news across the country. The farmers in the picture and many others had reached the breaking point. It was the age of usurious interest rates that made farming and other small businesses impossible to operate. The sympathy of much of rural Ontario was with those farmers who courageously brought the rural plight to the public’s attention. Many residents who lived and worked along the back roads of the province believed the real criminals were government leaders that sanctioned rates of more than 20% on an ongoing basis. (Some businesses paid up to 24% interest on operating loans during the period). Because of these rates, farmers had been in a fight for their lives and livelihoods against the bureaucracy and banks long before the picture appeared. But the photo-op was the point at which city folks finally sat up and took notice of the turmoil that was destroying lives and communities throughout the province. Thirty years have passed and there are similarities with the rural Ontario of today. Family farms are rapidly disappearing, even though the economics of agriculture have improved, particularly in the last few years. But relations with the government are little different. The province continues to run roughshod over rural communities as if nothing has been learned since1980. Green energy — particularly wind turbines — is one issue that has rural Ontario boiling. But there are many others, including the future of rural health care, government’s love for bigger schools even when they are no better, an assault on small school bus operators, mind-boggling regulations for something as simple as a liquor licence for a community dance, etc. The folks battling the wind turbines are among the first to reach a frustration point not seen since the ’80s. This week, those activist municipal politicians led a public shunning of Premier Dalton McGuinty by 80 or so delegates to the annual good roads convention. For their trouble, they got a vague promise that the province will restore “some” autonomy to municipalities that want to limit the number of wind turbines. “Some” change is the best the premier can come up with after years of rural residents battling the issue. Contrast that to the sudden response the province provided to Toronto when that council discussed transit needs in the Big Smoke and you get an understanding of how neglected and ignored rural residents feel. I asked one opponent of turbines about the similarities to the unrest of the early ’80s. “The time for civil unrest may be approaching,” this individual said. Combine that comment with others, such as “let’s meet cabinet ministers outside of the cities with spreaders full of manure” and it’s obvious trouble is brewing. Thirty years ago a band of gun-totin’ farmers got some action from the banks, the government and among themselves. That photo was the seminal event in the founding of the Canadian Farm Survival Association. An organization of rural ministries also sprang into action to help families facing loss of livelihoods and the possible suicide of family members. New ways were developed to finance the beef industry, based in part on the co-op model. Rural communities eventually calmed because something was being done about their concerns. Nothing is being done today. 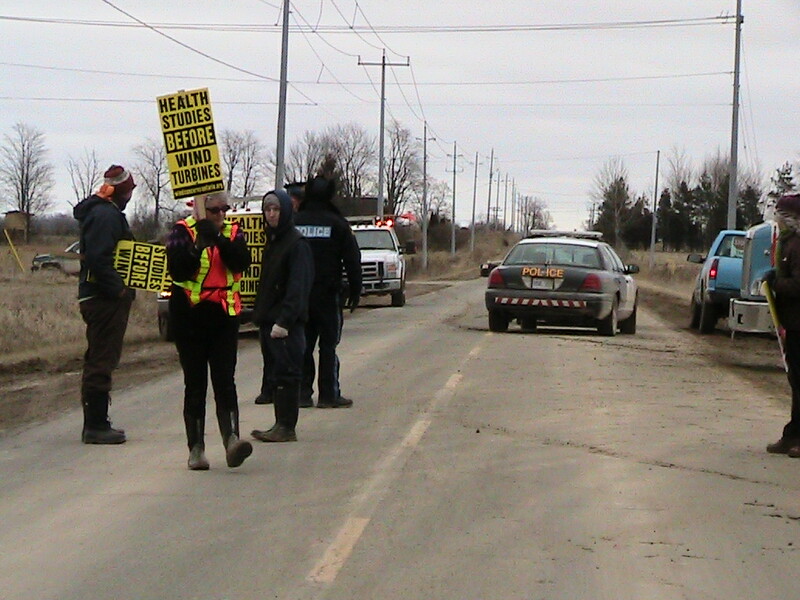 Posted on March 3, 2012, in Agriculture, Dalton McGuinty, Economics, Environment, Government, Green Energy Act, Health, London Free Press, Sarnia Observer, Take Action. Bookmark the permalink. 1 Comment. I read this in the Saturday London Free Press comment section and almost passed it by. Not until I was almost half way through was I aware that he was writing about Wind Turbines. He also makes it sound as if all farmers are against turbines, when in reality this issue is tearing apart our rural communities, turning neighbour against neighbour and family members against family member. I did, however, like his reference to farmers in the early 80’s who resorted to posing with shotguns to draw the attention of “the city folk” to their plight. Perhaps we should consider something similar…………….